One of the annual toddler recipes I made while teaching was Haupia. We made Haupia during Aloha week in Hawaii which is celebrated for six weeks during the months of September and October. 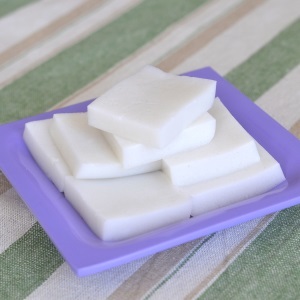 Haupia is a coconut milk based dessert found at luaus and other Hawaiian festivities. Although it is considered a pudding, it has the consistency of gelatin. It is a cool and refreshing treat. Combine sugar and cornstarch. Then add the water. Pour the coconut milk into the pot. Add the sugar, cornstarch and water mixture. Cook on medium high heat. Stir until it boils. Remove from heat after one minute. Pour into a 9 x 13 pan. Let cool until firm. Cut into squares. Refrigerate to keep fresh. Stir frequently to keep mixture from scalding. Easy activity to make a book to go along with the recipe. See photo below to facilitate the book making process. Cut into fun shapes with cookie cutters or Jello cutters. For each recipe we did in the classroom, I made a set of cards. This was great for practicing reading, sequencing and perfect if you choose to make a book. Each card represented one page. Refer to each card as you go. After the activity is completed, you can go back and talk about the sequence of the cooking activity and have children place cards in order. 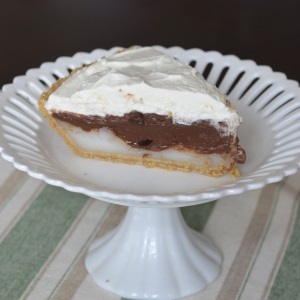 Haupie Pie is another way to enjoy Haupia. We will share recipe soon!